Kermit Erasmus finally made his chances count with a brilliant brace, before substitute Lehlohonolo Majoro got a third late on. Pitso Mosimane made two changes to his starting line-up, bringing in Surprise Moriri and Bongani Zungu for Themba Zwane and Asavela Mbekile, while Vladimir Vermezovic opted to replace Rooi Mahamutsa with Ayanda Gcaba in Pirates’ backline. The first half was a thrilling one, with the visitors almost getting the opener on five minutes when Gcaba met Erasmus’ corner at the back-post, but his header hit the side-netting. The opener wasn’t far off though. On 14 minutes a quick counter saw Happy Jele play Erasmus in, and the former SuperSport United man made no mistake with a precise chip from the edge of the area. After a brief lull in goalmouth action, the two sides then took turns in crashing the paint off the goalframe in three crazy minutes. 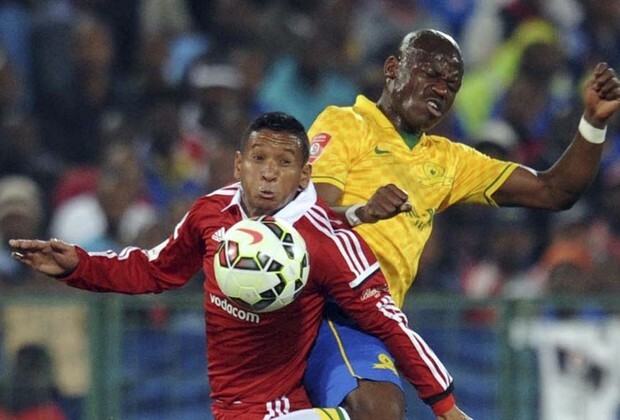 First Hlompho Kekana hit a trademark rocket past Senzo Meyiwa, but the ball cannoned back off the crossbar. From the counter, Thandani Ntshumayelo hit the side-netting, before Oupa Manyisa, with a late run into the box, connected with Erasmus’ square-ball, but he hit his close-range shot onto the upright. And just a minute later it was Surprise Moriri’s turn; his excellent control setting up a volley which crashed against the upright. Teko Modise then combined brilliantly with Bongani Zungu before firing straight at Meyiwa, before Erasmus showed the two sides to his game – first brilliant skill to turn a defender in the box, then firing wide from eight yards out. There was some action just before the break when Meyiwa misjudged a floating free-kick and spilled the ball. Alje Schut came charging in to score, but Issa Sarr made a timely challenge – one which saw the Brazilians’ captain replaced at half-time. There was drama just before the restart when Pirates lodged an official complaint, supposedly for Schut’s administrative card having expired. After much arguing on the touchline the match went ahead, with Downs pushing hard for an equaliser. It almost came when substitute Kuda Mahachi floated a cross to Niang, who controlled the ball on his chest, but Meyiwa rushed out to save. And then the suckerpunch as Pirates – and Erasmus – got their second. Sundowns lost the ball on the edge of the opposition area, and Daine Klate immediately played a long ball to Erasmus, who chipped Kennedy Mweene for a second time. The Brazilians kept pushing, with Kekana firing a grass-cutter just wide, before Thabo Nthethe had a header cleared off the line. It was even closer on 75 minutes as Pelembe skinned Sangweni in the area and fired off a shot, only for Meyiwa to pull off a stunning save. Pirates made it 3-0 soon after, and again it was on the counter-attack. Substitute Majoro made his way into the area and fired a cool finish past Mweene, though the defenders should have cleared before that. Sundowns squandered another great chance late on when Modise cross perfectly to the unmarked Elias Pelembe at the far-post, but the Mozambican winger leant back and fired way over. A night of drama was concluded in injury-time when Matlaba was red-carded for a late challenge on Mahachi, but by then the damage had been done as the Brazilians continued their poor start to the season.